Covenant Security Services Ltd., was recently awarded a protective guard services contract with the Department of Labor in partnership with The Watkins Security Agency of DC. A partnership including The Watkins Security Agency of DC and Covenant Security Services Ltd., were awarded a protective guard services contract with the Department of Labor. The contract includes 150 personnel with responsibility for entry control, command and control, and vehicle patrols for the Department of Labor Headquarters in Washington D.C. The contract is worth $41MM over 4+ years. The Watkins Security Agency of DC, the prime contractor, has been successfully providing armed and unarmed security guard service to local, state and federal government agencies, commercial properties, colleges, public utilities and Fortune 500 companies. Covenant Security Services, Ltd. is part of Covenant Services Worldwide, a privately owned leader in global security, training and assessments. 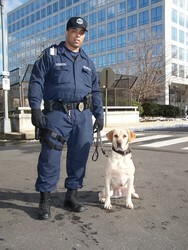 With offices throughout the United States, the company supports government and private company security needs with best-in-class armed/unarmed protective force, specialized response forces, public safety operations, security program planning & development, vulnerability & threat assessments consulting, crisis management & emergency planning, and canine security capabilities. "This win reinforces the Covenant Security brand as a world-class entity that our country and customers can rely upon for exemplary protective services," said Jim Robinson, Vice President at Covenant Security Services, Ltd. In addition to this new contract, Covenant Security currently provides protective security services in the nation's capitol for the Department of Energy and for the Department of Transportation.